So you want to be a ski instructor? It feels good to put on that uniform, you’re a respected member of the mountain community, you hold a great responsibility – keeping people safe and helping them to enjoy the sport you love. But what does it take to gain the qualifications required to become a ski instructor at an entry level? And how do you gain the very highest certification? We look at what it takes to become a ski instructor with the CSIA (Canadian Ski Instructors’ Alliance), from qualifying as a Level 1 instructor right the way to the very highest certification, Level 4. You can start work as a ski instructor as soon as you have your level 1 CSIA qualification but if you choose to become further qualified each level has a number of different components to it. The pathway to becoming a ski instructor is completely equal for male and female applicants (only at level 4 in the UK/French/ISIA system when a speed test is required that men and women have a different set of criteria to meet). Perhaps surprisingly, at this stage, the ability to be able to ski like a professional Olympic athlete isn’t a requirement. In fact, if you’re confident on red graded pistes and can perform a parallel turn competently, then you can apply. Our 4 week Intensive Training course is for those with prior skiing skills who want to gain Level 1 certification. During your training with us, you will be exposed to a variety of terrain and snow conditions while working on your core skiing and teaching skills. Once qualified as a level 1 instructor, you will have the skills to demonstrate beginner skiing techniques such as snowplough turns, stem turns and parallel turns with a high level of precision and control. You will be certified to teach skiers up to intermediate parallel skill level. Level 1 is a prerequisite for the Level 2 certification. For anyone considering work as a ski instructor, then gaining the level 2 qualification is of genuine benefit. Not only will you be able to teach better skiers but in terms of professional development, Level 2 takes things to a new level. Level 2 training (available on our 10 week Ultimate Experience course) will focus on advanced ski technique and teaching skills. Work on your short radius turns, carving and freeriding on un-groomed terrain. During the exam you will be expected to perform demonstrations of ski technique and exercises with a precision that out-classes any pupil you might have the pleasure of teaching! The CSIA system is based on education credits and to gain the Level 2 exam, 10 credits are required on top of the standard Level 2 training course and Level 2 Assessed Training course (both 2 days each). These credits can be made up by attending various modules that include, Guest Service module (mandatory), and at least one extra module that could include, teaching children, terrain assisted development or snow park introduction. Having a level 2 qualification can help open more doors in countries around the world – you’re now a professional ski instructor. Now things are getting really serious. You’ve spent some time teaching and love the job – your skiing has reached a level that you notice is now higher than you might have expected or way above your friends who are still one-week-a-year holiday enthusiasts. You feel comfortable all over the mountain, with an ability to handle all conditions both on and off-piste. When other skiers see you from the chairlift, they turn their heads and watch in appreciation as you descend the slope. It’s time to become a Level 3 instructor. 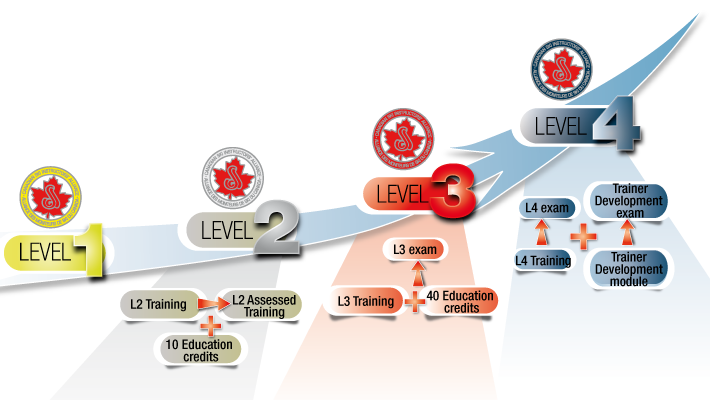 To achieve level 3 status, you need to get your education credits up to 40 – you’ll have 10 already from the Level 2 and the extra 30 can be worked on at any time leading up to the Level 3 training course, or afterwards if needed, but must be before attending the Level 3 exam itself. These modules include advanced teaching and coaching awards. The level required to gain this qualification is significantly higher that what you’ve been faced with before. You’ll be tested on your technical skiing skills and asked to provide lessons to your group of fellow instructors that challenge their thinking and skill set. A Level 3 instructor can teach pupils up to an advanced skill level. By the time you’ve reached this stage, you’re already deep into a career of ski teaching – it’s your life and you’re a fully professional ski instructor with lots of experience. You can ski the whole mountain with style and technical ability – demonstrate perfect turns on-piste, carve at high speeds, ski a mogul line directly and at speed, handle steep off-piste slopes with confidence and simply look great in the powder. Perhaps more importantly, you fully understand the responsibilities of customer care and safety on the mountain. Other instructors look up to you, they ask for advice and aspire to ski at your level. This is a serious professional qualification and it’s the equivalent of studying for a university degree. You will be able to train other ski instructors, work in many different countries around the world, take your clients all over the mountain including into off-piste terrain (although laws in each country vary in regards what is and isn’t possible when taking clients off-piste) and you’ll earn more money for it. The Level 4 qualification takes the form of a 4 day training course and a 4 day exam – you will need to demonstrate perfection on every run and anything less will mean failure. Only a very small percentage of ski instructors hold a Level 4 qualification. Do you have what it takes to become the very best?